In 2009 the eyes of the perfume-world were firmly fixed on the doors of No 68 Champs-Élysées in Paris. The world awaited the brand new feminine fragrance from the world’s most important (and arguably the greatest) perfume house – Guerlain. In the previous year Guerlain (now owned by the fashion-gargantuan Louis Vuitton Moët Hennessy) had appointed Thierry Wasser as their in-house perfumer and he had already started to create exciting fragrances for the house (see Guerlain Homme), but he was yet to conquer the mammoth task of creating a Guerlain feminine. A new feminine fragrance from Guerlain is always big news and it can’t be easy creating a fragrance for a house that brought Jicky, L’Heure Bleue, Mitsouko and Shalimar into the world, but with Idylle it felt like the pressure was REALLY on. Thierry Wasser had the huge tasking of creating a contemporary and modern fragrance that wouldn’t betray Guerlain’s age old heritage and for that reason Idylle is a relatively important fragrance, it signifies a shift within the house, and this shift is highlighted in the tag-line on the above advertising image, which presents Idylle as “The New Guerlain”. Guerlain describes Idylle (‘Love Dream’) as “Like a mist of petals on the skin, a fresh floral bouquet warmed by the sensuality of chypre”  and if only to emphasise the ideal of ‘The New Guerlain’, Idylle marks a complete break from the house’s tradition of lavish chypres, big florals and Guerlainade-filled orientals. Idylle opens with a mist of florals that are light, diffusive, slightly indolic and impossibly pretty. The floral mist fills the air with flashes of rose, jasmine, muguet, freesia and peony, like an English garden on a summers day. Rose is the ‘Floral Queen’ in Idylle and there is a wine-like sourness to the rose within the top notes, it is rich, warm and not at all jarring amongst the other flowers. The welcome addition of raspberry brings out the tart fruitiness of the rose and litchi emphasises the dewy, lighter aspects of the white florals. In the heart, Idylle becomes a dance between two of perfumery’s most classic notes; rose and patchouli. In this olfactory tango the rose is definitely taking the lead and the patchouli, which is very much of the clean variety – there are no hippies hanging around in this garden, is happy to be led. As Idylle progresses the wine-like quality of the rose intensifies and the patchouli adds a wonderfully dry and earthy woodiness that emphasises the darker parts of the rose. As much as Idylle is billed as a chypre, and despite the inflection of something mossy within the base it really is nothing of the sort, I would categorise it as a ‘Musky Floral’. White musks dominate the base and the patchouli-mossyness almost feels like an after thought that never really reached the effect that was originally intended. Idylle is not an overly strong fragrance, but it does project an intimate silage from the skin, however it doesn’t last anywhere near as long as a lot of the other Guerlain fragrances, and some Guerlain fans may find that it’s just a touch too light for them, I know I did. 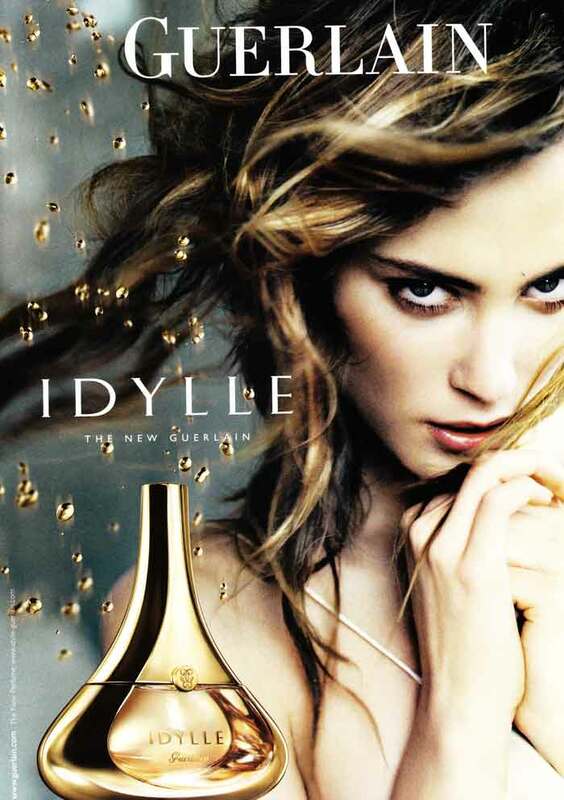 Others have said that Idylle is similar to Sarah Jessica Parker’s Lovely and Narciso Rodriguez For Her, and I would be lying if I said that the similarities weren’t there, but Idylle feels fresher and prettier and it is clear that Guerlain were aiming for a younger audience with Idylle, it is definitely girly, not womanly. 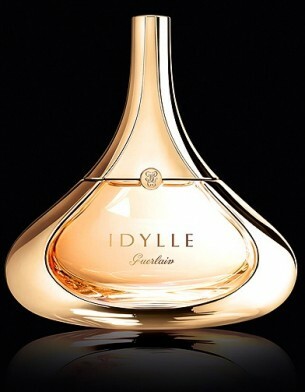 Idylle is a very pretty fragrance, but it is far from being my favourite Guerlain. I own a bottle but I don’t ever wear it and despite the fact that I wouldn’t say that it is typically ‘Guerlain’ in any way, it is very well done and I would, and have recommended it to people on many occasions as a pretty, yet contemporary floral. My sister, who obviously has impeccable fragrance taste if her brother is anything to go by, wears and loves it. It may not be a triumph of modern perfumery but Idylle is a worthy addition to the Guerlain lineup, it offers something different from the house and if you’re looking for a pretty floral then you could do a heck of a lot worse than Idylle. In true Guerlain style the bottle for Idylle is not only a vessel for the fragrance it contains, but is also a wonderful piece of art. Designed by artist Ora Ïto, the bottle represents a golden raindrop and it really is as beautiful in real life (if not more so) than the photograph. Idylle is available in 35ml, 50ml and 100ml Eau de Parfum and Eau de Toilette (which is a slightly different fragrance), with prices ranging from £39.90-£81.20 for the EDP and £34-£70.50 for the EDT. Matching body products and a series of flankers are also available. This year Guerlain also released an Extrait (Pure Parfum) version of Idylle, the Extrait is available in an 11ml bottle for £80.50. This review is based on a bottle of Idylle Eau de Parfum from my own personal collection. Posted in Chypre, Feminine, Floral, Guerlain, Perfume Reviews and tagged Chypre, Floral, Guerlain, Idylle, Perfume Review, Rose, Thierry Wasser. Bookmark the permalink. You sum up my thoughts on Idylle perfectly! I own it and have worn it often, used up about half of my bottle by now. It’s very pretty and never wrong-girly suits me fine-but not exactly exciting. I like it much better than NR For Her or SJP Lovely, they seem a bit crude in comparison. All the flankers and the EDT I find boring though. I agree it is a lot better than Lovely and For Her, it’s just so much prettier. Do you find Idylle Duet boring? I’d heard good things about that one. I’ve only tried it very briefly and there was nothing wrong with it but to me it lacked character. Especially if you compare it with other rose-patchouli perfumes like Portrait of a Lady! Apparently Guerlain is launching another Duet flanker with jasmine and lilacs, perhaps that one will work better? I can see what you mean, Portrait of a Lady is the ultimate rose/patch scent, and I guess nothing else quite compares! Lovely review, which captures every facet of this scent. Like you, Idylle comes across to my nose more as a musky floral. And as well as Lovely and Narciso Rodriguez, I would liken it to Lady Vengeance a bit. I had never thought of it as similar to Lady Vengeance, but now you mention it I can totally see it. Idylle shares the same wine-like rose note as LV, and it’s almost a mistier, less powdery version. I agree, Idylle is very feminine. I would say that Lady Vengeance is heavier than Idylle though, it has more powder and is more rose-centric than Idylle. P.S. don’t worry, I’m not just stopping by, I’m following you! I nearly ran screaming from this thing. I agree with your review of it as being primarily a musky floral, and focused on rose/patch… it’s just that I am unnaturally sensitive to patchouli, and wearing the EdP was like being Fay Wray in the arms of King Kong PUT ME DOWN YOU BIG BEAST!! Oddly, the EdT version I liked quite a bit. Seems like the muguet in that one has just dope-slapped the patchouli so that it’s not stomping around and pounding on its chest. Haha, that’s definitely a funny image, and quite sup rising too as I always think of Idylle as quite a light fragrance, as you say you must be unnaturally sensitive to patchouli. The EDT is much nicer if you aren’t a patch fan, it focuses more on the ‘floral mist’ side of Idylle, which is definitely my favourite part. Still, it’s good but not a classic Guerlain, but I guess they don’t all have to be amazing.